What a whisper they make. The shadow of their spectre sulks and swells. making it easier for them to escape. waiting to breaking apart each glass petal like an unaccountable supernatural. I find nothing supernatural about them. They are a walking advertisement for their own self. Their impolite view smells toward something intangible. This was beautiful and somber at the same time, love it! 'Bouquet of words,' brilliant, Doc, mine has wilted--err--my bouquet of words! Like Mike, I was particularly drawn to the 'bouquet of words' but also to the 'disenchanting spell' too. 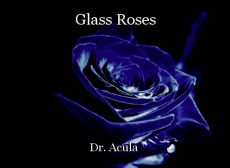 Glass rose petals could be quite beautiful in a cold way, Doc. Thank you very much, Lisbeth ! O MISS PINKIE SAID 1974.